Canal Street is Manhattan’s preeminent traffic sewer. A loud, dirty, menacing torrent of motorized traffic with cramped sidewalks and no designated space for bicycling, Canal gets pulverized by the “trucker’s special,” which gives motorists a free ride across Lower Manhattan via the untolled Manhattan Bridge to the untolled westbound Holland Tunnel. The thousands of residents, workers, and tourists who traverse the street on foot every day are shoved to the margins. Traffic crashes have killed 13 people on Canal since 2009, leading Transportation Alternatives to call it “Manhattan’s Boulevard of Death.” Last year, the victims included cyclist Edouard Menuau and a motor vehicle occupant who were killed in separate collisions at Bowery and Canal, at the foot of the bridge. Motorists have seriously injured 89 pedestrians and 39 cyclists on Canal since 2015, TransAlt says. TransAlt has posted a petition calling for Canal Street to be overhauled for safe walking and biking. If you can make Canal Street a walkable, bikeable street, you can do it anywhere. The goal is to gather 10,000 signatures and deliver them to city, state, and federal representatives, as well as local community boards. There’s a strong connection between making Canal Street safer and enacting congestion pricing. Putting a price on the East River bridges would immediately shift some truck trips away from surface streets in Chinatown, Soho, and Tribeca by disrupting the free ride for westbound traffic across Manhattan, an issue that Council Member Margaret Chin tried to compel the city to address in 2015. The reduction in bridge traffic enabled by congestion pricing opens up possibilities for physical design changes too. As with other traffic sewers feeding the East River bridges, ending the free ride for motorists would make it easier to claim street space on Canal for people walking and biking. It is misleading to describe the westbound Holland Tunnel as “untolled.” Because there really is no way back East over the Hudson without paying the toll. It would be misleading to call the Holland Tunnel “untolled” because there’s a toll in the eastbound direction. It’s not misleading to call it untolled in the westbound direction, because it’s not tolled in the westbound direction, and as the graphic explains, that creates skewed incentives. I also want one of these petitions for the Broome/Watts approach to the Holland Tunnel! I think the main point the article is trying to make (but not making well) is… if you look at a map, it’s clear that trucks headed from Long Island (including Brooklyn & Queens) to NJ should be going through Staten Island instead of Manhattan. However, the tolling structure makes that route more expensive, not cheaper, leading to excess truck traffic on Canal St. The Holland Tunnel is not the problem here. Note that ALL crossings to NJ cost the same. There is no way to toll-shop, short of driving around to the Tappan Zee. Had the map been expanded to show the Goethals and Bayonne Bridges, this would have been made clear. The NY-NJ crossings are therefore irrelevant when discussing skewed incentives. 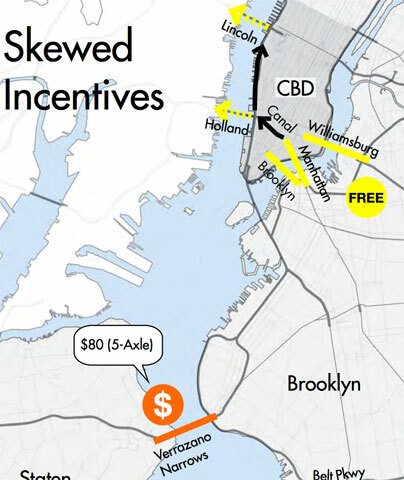 The skewed incentive comes from the EXTRA toll on the Verrazano Narrows Bridge, which is an intra-NYC bridge. Although it does cross the geographic Hudson River, the Verrazano Narrows Bridge is topologically similar to the East River crossings. To prevent toll shopping, it should cost the same as the Manhattan, Brooklyn, Queensboro, etc. Five-axle trucks are prohibited at the Holland Tunnel. In addition to the free East River crossing, the Verrazano is only tolled Westbound. All other Hudson River crossing are tolled Eastbound. This creates incentives to take circuitous routes and causes extra traffic on Westbound Canal. The Verrazano is NOT a Hudson River Crossing. Once you’ve crossed it, you still have to take a Port Authority-owened “Hudson River Crossing” to get to NJ — either the Goethals or Bayonne Bridge. Both have the same toll structure as the Holland, Lincoln and GWB. What the one-way tolling DOES do on the Verrazano is, it makes it advantageous to go through Staten Island eastbound but Canal St when heading back westbound to NJ. But BOTH routes, you have to pay the PA toll for the Hudson River Crossing. LOL – you see them every day exiting. When will Streetsblog and Transportation Alternatives address the REAL cause of the Canal Street mess: the REVERSED toll on the Verrazano Bridge. The reversed toll enables truckers and motorists to avoid the eastbound toll on the Holland Tunnel by coming free eastbound over the Verrazano and using the BQE to go eastbound, to the detriment of Brooklyn. The truckers then return westbound using Canal Street to get a free toll going west. Initiated in 1986 as a temporary experiment, Staten Island Republicans have managed to preserve the reversed toll despite efforts from local Downtown activists to return it to its original . Yet despite all its talk about reducing traffic in the city both Streetsblog and TA have been ineffective and basically silent on the issue. WHEN WILL STREETSBLOG AND T.A. FINALLY ACT TO ADDRESS THE ROOT CAUSE OF THE PROBLEM INSTEAD OF PUSHING INEFFECTIVE PETITIONS? Thank you Elizabeth! I dont understand how these commentators cant grasp that.